The slate industry included two specific types of owners. On one hand, were the traditional aristocratic families such as the Pennant and Assheton-Smith families, and on the other the entrepreneurial adventurers who owned many of the quarries in the Nantlle and Blaenau Ffestiniog districts. This division held true until the First World War. However, syndicates of local men quite often took out leases on smaller quarries. John Jones (1796-1857) was one of the most influential Welsh preachers of his generation. To leaders like John Elias (1774-1841), he was regarded as a dangerous radical. But to be true, Elias would regard anybody who dared disagree with him on the weather forecast for the day as a threat to society. Interestingly, David Lloyd George held John Jones in so much adulation, that his portrait hung in Downing Street when Lloyd George was both Chancellor of the Exchequer and Prime Minister. Shop keeping was an important occupation for Welsh preachers in the first half of the nineteenth century. The wife would run the business, thus enabling the husband to go on preaching journeys around the country. Since John Jones’ cousin had married Griffith Williams, one of the managers of the Talysarn Quarry, a position was found, or created for him in 1822. The following year, he married Fanny Edwards, below, a daughter to Thomas Edwards, overseer at Cloddfa’r Lon Quarry. Jones, right, consequently left the quarry, and Fanny, in the true Methodist tradition, opened a shop that sold everything from tincture of rhubarb to quarry tools. Not only was the shop situated next door to the chapel, it was also in close proximity to the quarries. The lease on Dorothea appears to have expired in 1848, and John Jones and some of his associates set up their own company. But as luck would have it the slate industry slipped into decline. Wages were cut which made him unpopular with the workers. The situation further deteriorated, when he was accused of being unfair and sacking the best quarrymen. His reasoning for doing this was that he felt that his priorit y was to give employment to the poorest quarrymen regardless of their ability. He came close to suffering a fatal accident at the quarry in 1852, and this led him and his partners to terminate their links with quarrying in 1853. When he died five years later, his body was placed snugly within three coffins, one of oak, one of mahogany and one of slate. And as a final tribute a huge memorial was placed over him at Llanllyfni Churchyard. 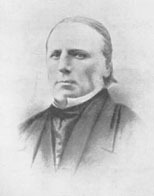 His eldest son, John Lloyd Jones (1826-93), from Plas y Bryn, Bontnewydd became one of the chief managers of Dorothea and Penyrorsedd Quarries. 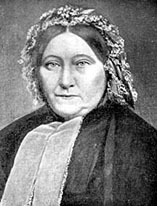 Fanny Jones died in 1877. Neither should it be forgotten that John Jones, below, was grandfather to George M.Ll. 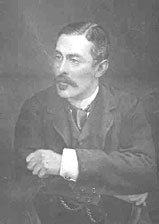 Davies (1880-1949), the famous pacifist. Politically, there was the Tory interest vested in the Penrhyn family and the Liberal interest in Samuel Holland. However, it cannot be denied that the most powerful men in the industry were the Pennants of Penrhyn and the Assheton Smiths of Faenol. These paramount interests were crucial to the whole industry and by their pricing policies controlled not only the slate market in general, but also to a considerable degree the fortunes of smaller quarries. Other, more modest, quarrying landowners, involved in the industry were the Newboroughs of Glynllifon, the Oakeleys of Tanybwlch, the Price family of Rhiwlas and the Williams-Bulkeley family of Baron Hill.